So, what have I been up to, besides not blogging, raveling, tumblring, twittering on occasion, and Facebooking? My last couple of weeks, let me show you them. It was seriously fun and I am definitely going to do it again next year. I didn’t get much this time. I was mostly along for the ride with a friend who was buying yarn for her holiday knitting. And that’s it, you’re all pretty much caught up now. How has your summer been so far? Keeping busy? 1. The Tour de Fleece is still going and I am still spinning. 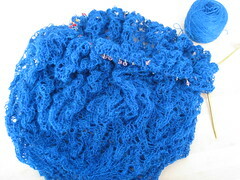 I made a nice fat hank of Corriedale yarn and started on the Romney fleece. 2. 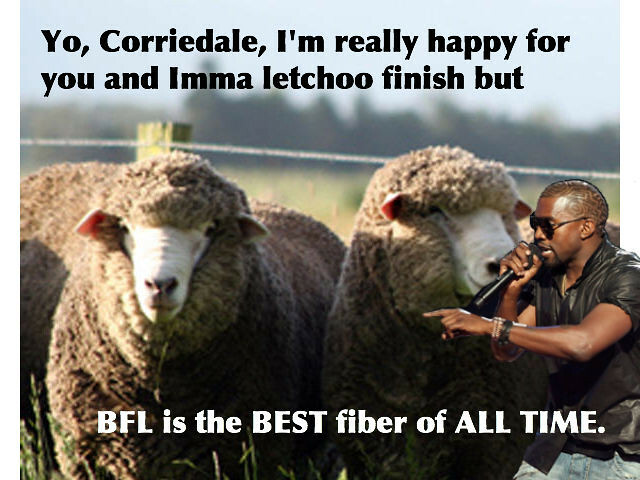 Corriedale is nice to spin, but I still prefer BFL. 3. There are 6 lbs. of the Romney fleece. I’ve spun exactly 2 ounces and I am already sick of it. 4. You cannot spin at the beach. At least, I haven’t figured out a way to do it. 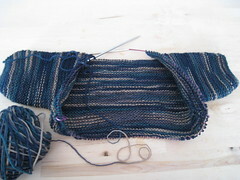 Perhaps w/ a drop spindle, but I don’t fancy sand in my fiber, so no. 5. We’ve been at the beach a lot. But, evidently it’s jellyfish season and since E4 appears to be allergic to their stings, we might not go back for a while. 6. I’ve started the rewriting process on my NaNo. It’s pretty terrible, but not as terrible as I thought. And I think I know where I’m going to start. I think. 7. I was going to work on it this morning, but I spent too much time making the Kanye Interrupting Sheep image and now I have to do houseworky things. Stoopid never ending houseworky things. 1. My energy levels have been all wonky lately, hence the quietness of The Blog. 2. I am working on it w/ my Doctor, but in the mean time, I’ve been spending a lot of time on tumblr. If you aren’t familiar with tumblr, it’s kind of like a step up from twitter. If twitter is a micro-blog, then tumblr is a mini-blog. I’m still trying to get the hang of it, but ya’ll? I really like it. Check it out. You have to be a tumblr follower of mine to leave a comment (which means you have to have a tumblr account) or you can just subscribe to my tumblr rss feed. Either way is cool, but you know how I love the comments. 3. I was playing around with Plurk for a while, as a possible replacement to Facebook, but not enough none of my FB buddies were similarly motivated to follow me over to Plurk, so I give up. I will focus on Twittering and Tumblring instead. 4. Speaking of Twitter, I gave in. I guess now that it’s not in the news every two seconds, it’s more tolerable. The only problem is I find I get that stupid Fail Whale a lot. Twitter, if you’re going to be the “in” thing, please get some more servers! Which reminds me. I am troubled that it isn’t immediately apparent how Twitter makes money. There aren’t any ads that I can see. So, where are they getting the scratch for that operation? It’s a mystery. 5. PEOPLE!! 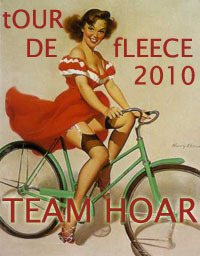 TOUR DE FLEECE STARTS TODAY!!! Are you participating? I’m on Team Hoar! 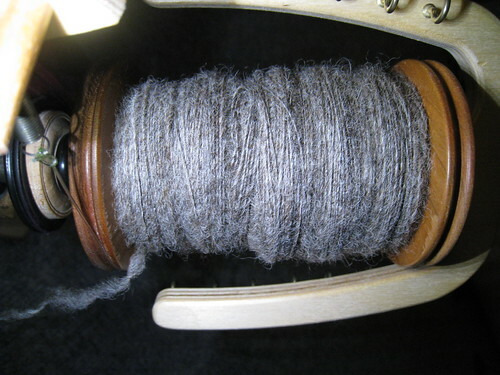 My plan, since I am new to Tour De Fleece, is to just spin every day and get through as much of my fiber stash as I can. 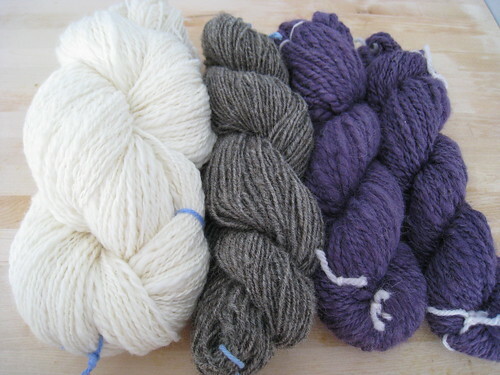 Granted, I am a new spinner, and my stash is not as enormous as it could be, but I do have a fair amount of fiber. Right now I have some Spunky Eclectic Corriedale on my bobbin. When that’s done I’ll move onto the Romney fleece that I’d had processed a while back. There’s a crapton of that, but if by some miracle I get through it all, I will move onto the alpaca and then the quiviut blend that I picked up at the Sheep and Wool Festival in April. GO TEAM HOAR! 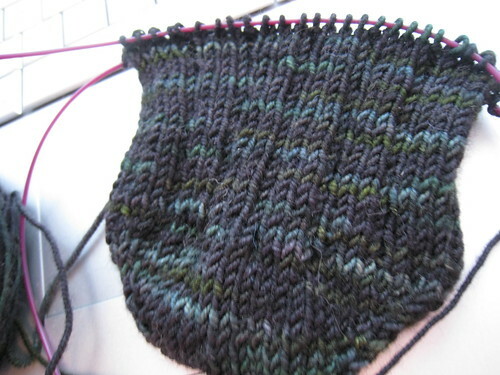 Hopefully, this sock with this yarn will get finished this time. 7. I finished a scarf for E4. Yes, it is a fun-fur scarf. Yes, I knitted it against my will. 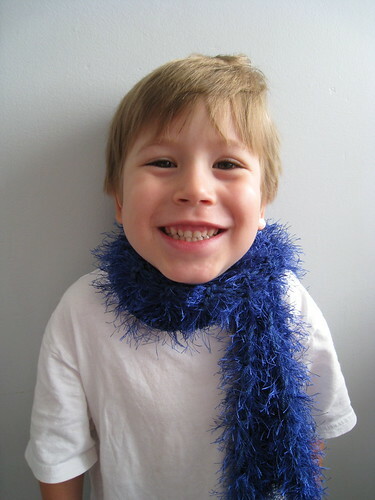 But, before you knock the fun-fur scarf, keep in mind that the whole thing only took up about an hour of knitting time. Maybe less. And, when people see the fun-fur scarf, they think you are a god damned genius. 8. We are dog sitting. 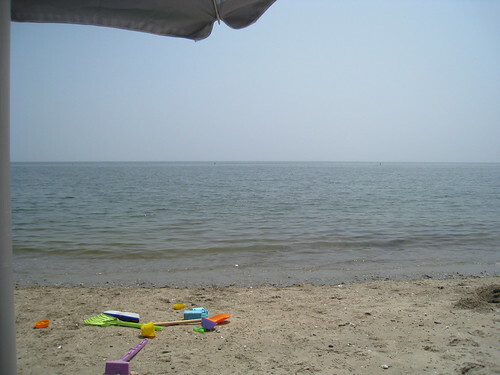 My friend and her family went out to Salt Lake for 3 weeks to visit family. Things are going well on this end. 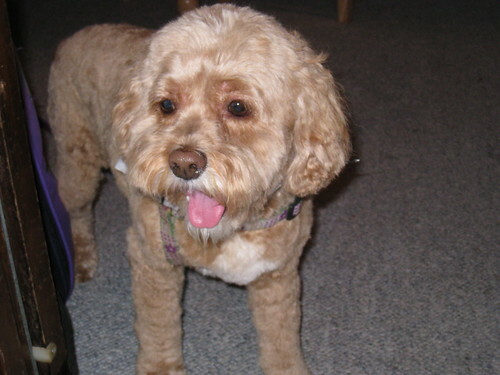 Sandy is a very good dog, but she still finds the cats to be terrifying, stabbity creatures. Doozer is still being kind of a jerk, although Lolly has warmed up to her quite a bit. No pictures of them all together, though. It usually doesn’t end well. 9. I’ve printed my NaNo 2009 for a reread/rewrite. I think this could be a good book, ya’ll. But it needs some work. A lot of work. And when I say “a lot”, I mean a LOT. Interested in being a reader? Leave me a comment. I’d love some feedback on it. And that is all. The Blog is now updated. How’ve you all been?